Keeping track of the Trump administration’s foreign policy is like trying to track a cat on a hot tin roof: We’re pulling out of Syria (not right away). We’re leaving Afghanistan (sometime in the future). Mexico is going to pay for a wall (no, it isn’t). Saudi Arabia, Russia, the European Union, China, Turkey, North Korea – one day, friends, another day, foes. Even with a scorecard, it’s hard to tell who’s on first. 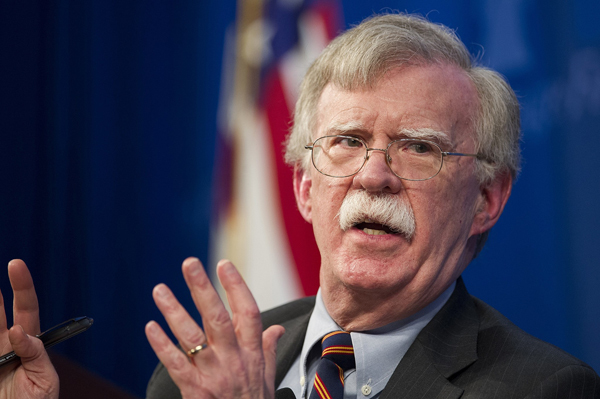 Late last year, National Security Advisor John Bolton pressed the Pentagon to produce options for attacking Iran, and he has long advocated for military strikes and regime change in Teheran. “If you look at the range of ultimate objectives” of the administration, from encouraging “protests that pose an existential threat to the system, to change of behaviour, to coming back to the negotiating table, none of that is happening,” Ali Vaez of the ICG’s Iran Project, told Laura Rozen of Al-Monitor. This time around, the US is pretty much alone. While the Trump administration is preparing to withdraw from the 2015 nuclear agreement – the Joint Comprehensive Plan of Action – the European Union (EU) is lobbying Iran to stay in the pact. Russia, China, Turkey and India have also made it clear that they will not abide by the US trade sanctions, and the EU is setting up a plan to avoid using dollars. Such a war would be unpopular in the US. Some 63 percent of Americans oppose withdrawing from the nuclear agreement and by a margin of more than two to one, oppose a war with Iran. While 53 percent oppose such a war 7 percent strongly so – only 23 percent would support a war with Iran. And, of those, only 9 percent strongly support such a war. The year 2020 is also the next round of US elections where control of the Senate and the White House will be in play. While wars tend to rally people to the flag, the polls suggest a war with Iran is not likely to do that. The US would be virtually alone internationally, and Saudi Arabia is hardly on the list of most American’s favourite allies. And it is not even certain that Israel would join in, although Prime Minister Benjamin Netanyahu calls Iran an “existential threat.” Polls show that the Israeli public is hardly enthusiastic about a war with Iran, particularly if the US is not involved. A meeting last September of Saudi Crown Prince Mohammed bin Salman and Emir Sabah Al-Sabah of Kuwait to discuss problems between the two countries apparently went badly. The two countries are in a dispute over who should exploit their common oil fields at Khafji and Wafra, and the Saudis unilaterally stopped production. The Kuwaitis say they lost US$18 billion revenues and want compensation. Lebanese legal scholar, Ali Mourad, told Al-Monitor that Kuwait has tightened its ties to Turkey because “they are truly afraid of a Saudi invasion,” especially given “the blank cheque Trump has issued” to Prince Salman. Would – or could – Ankara really defend Kuwait from a Saudi attack? Turkey is currently bogged down in Northern Syria, at war with its own Kurdish population, and facing what looks like a punishing recession. Its army is the second largest in NATO, and generally well-armed, but it has been partly hollowed out by purges following the 2015 coup attempt. So is Bolton just blowing smoke when he talks about regime change in Iran? Possibly, but it is a good idea to take the neo-conservatives at their word. The US will try to get Iran to withdraw from the nuclear pact by aggressively tightening the sanctions. If Teheran takes the bait, Washington will claim the legal right to attack Iran. Bolton and the people around him engineered the catastrophes in Afghanistan and Iraq (the Obama administration gets the blame for Libya and Yemen), and knocking out Iran has been their long-time goal. If they pull it off, the US will ignite yet another forever war.